This chapter, in briefly reviewing the history of language teaching methods, provides a background for discussion of contemporary methods and suggests the issues we will refer to in analyzing these methods. From this historical perspective we are also able to see that the concerns that have prompted modern method innovations were similar to those that have always been at the center of discussions on how to teach foreign languages. Changes in language reaching methods throughout history have reflected recognition of changes in the kind of proficiency learners need, such as a move toward oral proficiency rather than reading comprehension as the goal of language study; they have also reflected changes in theories of the nature of language and of language learning. Kelly ( 1969) and Howatt (1984) have demonstrated that many current issues in language teaching are not particularly new. Today's controversies reflect contemporary responses to questions that have been asked often throughout the history of language teaching. As "modern" languages began to enter the curriculum of European schools in the eighteenth century, they were taught using the same basic procedures that were used for teaching Latin. Textbooks consisted of statements of abstract grammar rul es, lists of vocabulary, and sentences for translation. Speaking the foreign language was not the goal, and oral practice was limited to students reading aloud the sentences they had translated. These sentences were constructed to illustrate the grammatical system of the language and consequently bore no relation to the language of real communication. By the nineteenth century, this approach based on the study of Latin had become the standard way to studying foreign language in schools. A typical textbook in the mid-nineteenth century thus consisted of chapters and lessons organized around grammar point. Each grammar point was listed rules on its use were explained, and it was illustrated by sample sentences. Nineteenth-century textbook compilers were mainly determined to codify the foreign language into frozen rules of morphology and syntax to be explained and eventually memorized. Oral work was reduced to an absolute minimum while a handful of written exercises, constructed at random came as a sort ' of appendix to the rules. This approach to foreign language teaching became known as the Grammar- Translation Method. The goal of foreign language study is to learn a language in order to read its literature or in order to benefit from the mental discipline and intellectual development that result from foreign-language study. Grammar translation is a way of studying a language that approaches the language first through detailed analysis of its grammar rules, followed by application of this knowledge to the task of translating sentences and texts into and out of the target language. It hence views language learning as consisting of little more than memorizing rules and facts in order to understand and manipulated the morphology and syntax of the foreign language. The first language is maintained as the reference system in the acquisition of the second language” (Stern 1983: 455). Reading and writing are the major focus; little or no systematic attention is paid to speaking or listening. Vocabulary selection is based solely on the reading texts used, and words are taught through bilingual word lists, dictionary study, and memorization. In a typical Grammar-Translation text, the grammar rules are presented and illustrated, a list of vocabulary items are presented with their translation equivalents, and translation exercises are prescribed. The sentence is the basic unit of teaching and language practice. 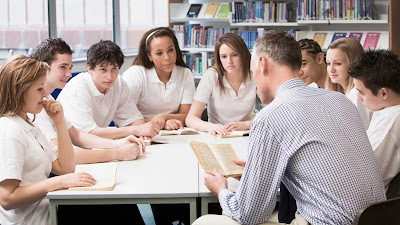 Much of the lesson is devoted to translating sentences into and our of the target language, and it is this focus on the sentence that is a distinctive feature of the method. Earlier approaches to foreign language study used grammar as an aid to the study of texts in a foreign language, But this was thought to be too difficult for students in secondary schools, and the focus on the sentence was an attempt to make language learning easier (see Howatt 1984: 131). Accuracy is emphasized. Students are expected to attain high standards in translation, because of "the high priority attached to meticulous standards o f accuracy which, as well as having an intrinsic moral value, was a prerequisite for passing the increasing number of formal written examinations that grew up during the century" (Howatt 1984: 132). Grammar is taught deductively that is, by presentation and study of grammar rules, which are then practiced through translation exercises. In most Grammar-Translation texts, a syllabus was followed for the sequencing of grammar points throughout a text, and there was an attempt to teach grammar in 3n organized and systematic way. The student’s native language is the medium o f instruction. It is used to ex plain new items and to enable comparisons to be made between the foreign language and the student's native language. Grammar Translation dominated European and foreign language teaching from the 1840s to the 1940s, and in modified form it continues to be widely used in some parts of the world today. At its best, as Howatt (1984) points out, it was not necessarily the horror th at its critics depicted it as. Its worst excesses were introduced by those who wanted to demonstrate that the study of French or German was no less rigorous than the study of classical languages. This resulted in the type of Grammar Translation courses remembered with distaste by thousands of school learners, for whom foreign language learning meant a tedious experience of memorizing endless lists of unusable grammar rules and vocabulary and attempting to produce perfect translations of stilted or literary prose. Although the Grammar-Translation Method often crea tes frustration for students, it makes few demands on teachers. Toward the mid-nineteenth century several factors contributed to a questioning and rejection of the Grammar-Translation Method. Increased opportunities for communication among Europeans created a demand for oral proficiency in foreign languages. Initially this created a market for conversation books and phrase books intended for private study, but language teaching specialists also turned their attention to the way modern languages were being taught in secondary schools. Increasingly the public education system was seen to be failing in its responsibilities. In Germany, England, France, and other parts of Europe, new approaches to language teaching were developed by individual language teaching specialists, each with a specific method for reforming the teaching of modern languages. The Frenchman C. Marcel (1793-1896) referred to child language learning as a model for language teaching, emphasized the importance of meaning in learning, proposed that reading be taught before other skill s, and tried to locate language teaching within a broader educational framework. The Englishman T. Prendergast (1806-1886) was one of I he first to record the observation that children use contextual and situational cues to interpret utterances and that they use memorized phrases and "routines" in speaking. He proposed the first "structural syllabus," advocating that learners be taught the most basic structural pattern occurring in the language. teaching new meanings through establishing association ns within the target language rather than by establishing associations with the mother tongue. translation should be avoided, although the mother tongue could be used in order to explain new words or recheck comprehension. These principles provided the theoretical foundations for a principled approach to language teaching, one based on a scientific approach to the study of language and of language learning. Classroom instruction was conducted exclusively in the target language. Only everyday vocabulary and sentences were taught. Oral communication skills were built up in a carefully graded progression organized around question-and-answer exchanges between teachers and students in small, intensive classes. New teaching points were introduced orally. Concrete vocabulary was taught through demonstration, objects, and pictures; abstract vocabulary was taught by association of ideas. Both speech and listening comprehension were taught. Correct pronunciation and grammar were emphasized. Particular methods differ in the way they address these issues. But in order to understand the fundamental nature of methods in language teaching, it is necessary to conceive the notion of method more systematically. This is the aim of the next chapter, in which we present a model for the description, analysis, and comparison of methods. This model will be used as a framework for our subsequent discussions and analyses of particular language teaching methods and philosophies. Richards, Jack C. and Theodore S. Rodgers. (1986). Approaches and Methods In Language Teaching. USA: Cambridge University Press. 0 Response to "A Brief History of Language Teaching"